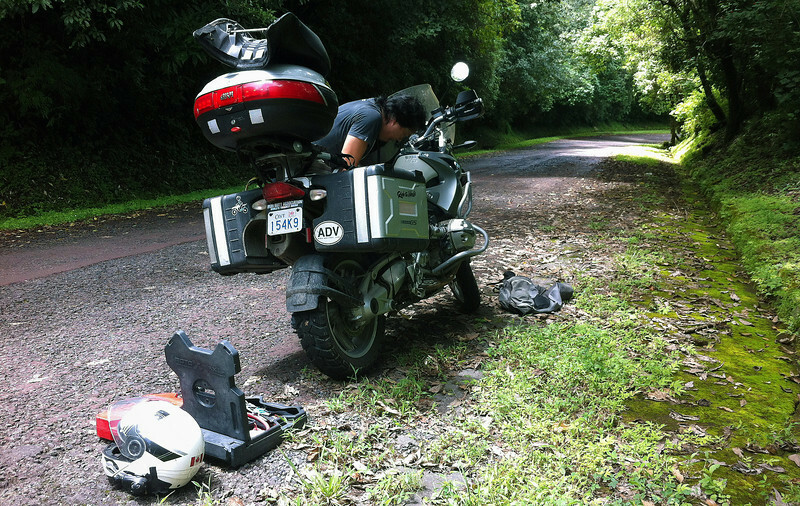 Sep 27 2013: Stranded in El Salvador! It started out as quite a nice day. 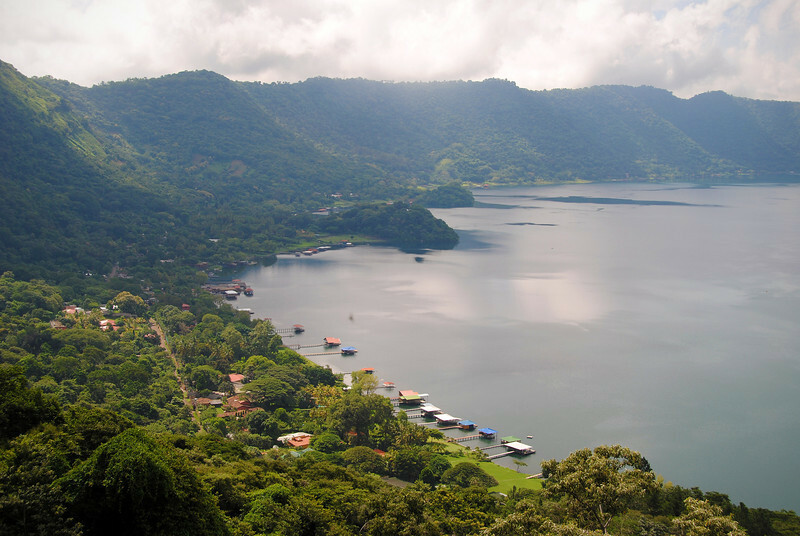 Neda planned a great day trip out to Lago de Coatepeque, a lake that formed inside a volcanic caldera. It's similar to Crater Lake in Oregon, only not as large. It even has a small island inside the caldera, just like Wizard Island. Only about 45 minutes away, we made sure to leave early to beat the afternoon rains. 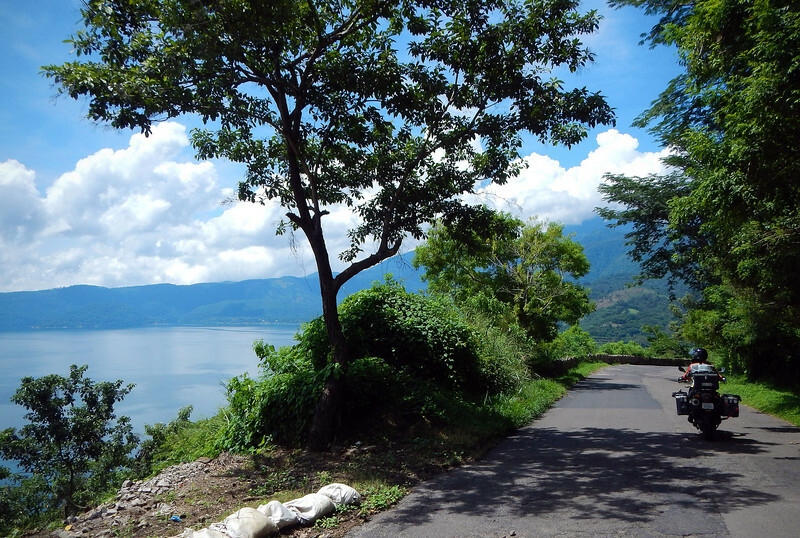 There's a small restaurant right at the lip of the volcano looking down into the lake, from there we have a beautiful view. The waiter gave us the menu and we asked what items were available, since we've found that most restaurants we've been to lately only have a limited selection. He answered that everything on the menu was available. Us: "Do you have the rabbit?" Us: "What about the vegetable plate?" Him: "Let me check.... No." We pulled over a few times to take pictures. However at one stop, half-way up the climb, I turned the key and got the dreaded "EWS" message on my console. 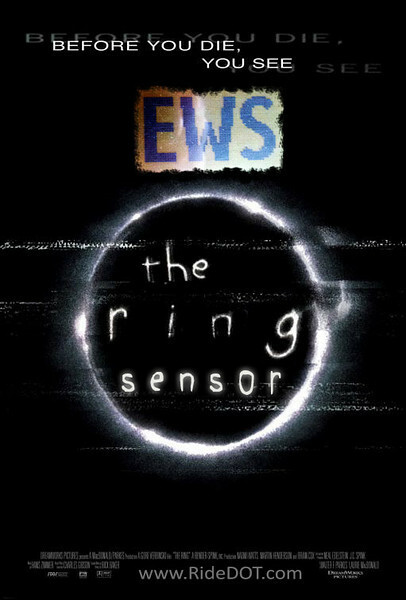 "EWS" stands for "Elektronische Wegfahr Sperre" and is a fancy German way of saying "Chu're not going anywhere, mein freund." 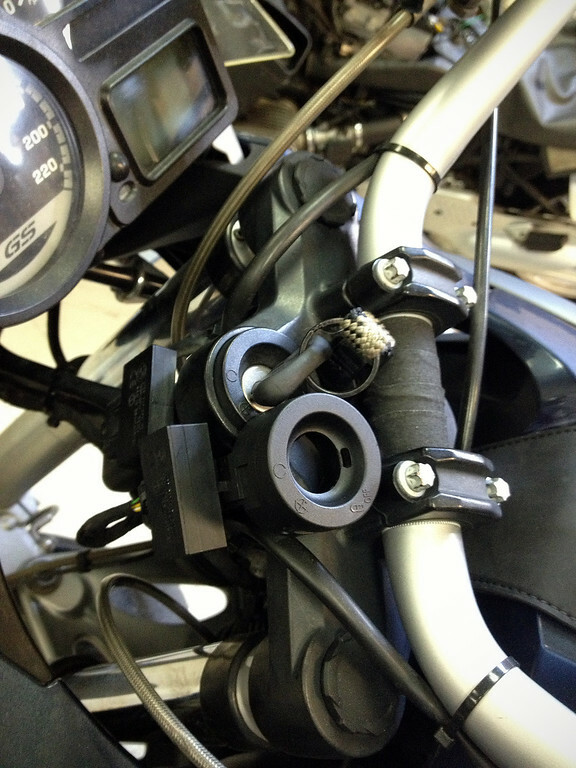 EWS is an electronic immobilizer, it's an anti-theft control that communicates with the RF chip in your key so that nobody can hotwire your bike. Pollyanna that I am, I am still thinking it might not be a ring sensor failure. Sometimes if the voltage is too low, it can trigger a fault. I flag down a couple of cars to see if maybe I can get a jumpstart from a battery with good voltage. A family in an old truck pull over and I ask if they have jumper cables. 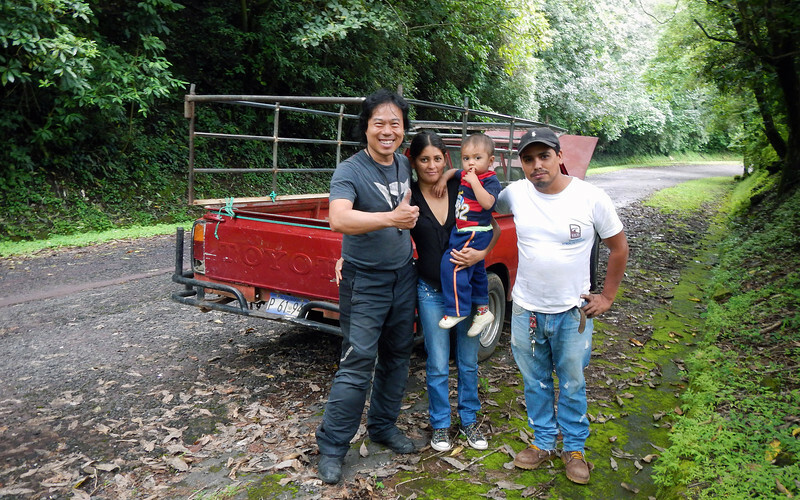 The gentleman's name is Francisco and he replies no, but immediately gets out, pops his hood and starts to remove the battery from his truck *AND* the connecting cables! 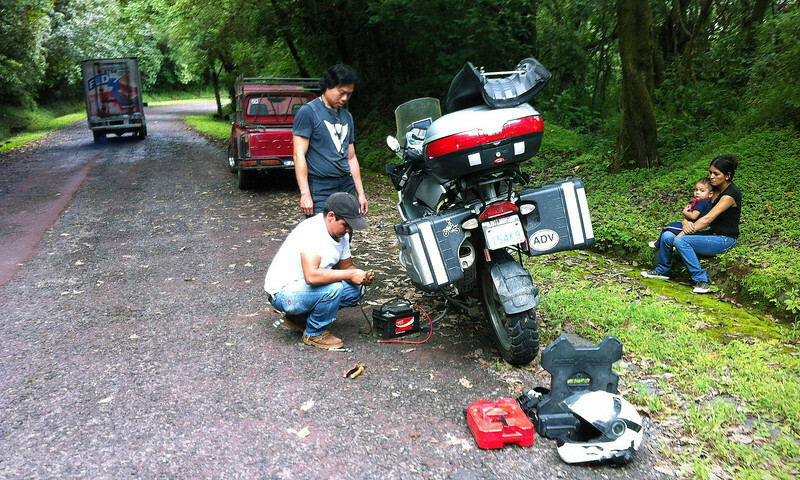 The cables are too short to reach, so I have to hold the battery while Francisco makes the connections manually, and Neda turns the key and tries to start the bike. Francisco to the rescue! His family cheers us on. Nothing. The letters "EWS" stare at me mockingly. I'm stranded. The sky is darkening and it looks like it's going to rain. Great. We assess the situation. We need to get the bike to a dealership. Can we load it into Francisco's truck? Not 550lbs without a ramp, we can't. Maybe we can call for a tow? We're in the middle of nowhere and San Salvadore is 100kms away, how much is that going to cost? I get desperate. We put together my bike and because we've ridden uphill for the last 15 minutes, I try bump starting my bike while coasting downhill. There is so much compression from the huge cylinders that I'm locking up the rear wheel in 2nd and 3rd gear. Put it in 4th and then jump on the seat while popping the clutch. The engine wants to turn over, I can hear it, and I get my hopes up. But still nothing. The EWS is preventing me from bump starting the bike. That's what it's supposed to do - prevent hotwiring, bumpstarting, etc. Academically, I know all of this. Yet I am desperate to try anything. I turn the key off and on, off and on, many times and then... that one time I try.... No EWS. I thumb the starter quickly as if those dreaded three letters will appear if I don't turn the engine over in time (rational thought escapes you in times like these). The engine starts with a rumble. As if nothing ever happened. Even though all of our collective efforts really didn't do anything, it was the ring sensor that decided to work that one time, I couldn't thank Francisco enough. It's times like these when I get so buoyed by how kind and generous people are. He gave us his telephone number and told us to call him if we needed anything else. I wanted to hug him. With the sky threatening rain, we had to ride to San Salvadore to the dealership before it closed for the day. Fighting though big city traffic, I was conscious not to turn the engine off, stall the bike, and at stops - to put the kickstand up before I kick it out of neutral etc. 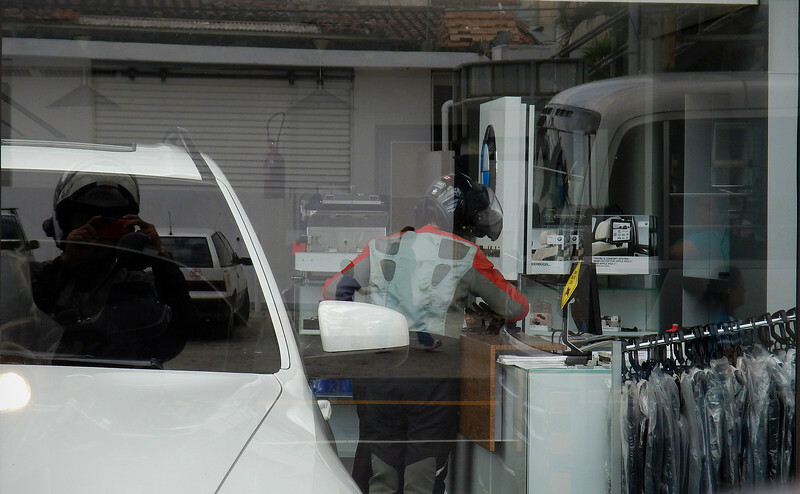 We pulled into a BMW dealership and I sent Neda in to make sure it was the actual service centre before I turned the bike off. Thankfully we did that, because the actual service was about 7 kms away from the dealership. "So what I was thinking is that I don't turn the engine off for the rest of the trip. Just sell me a keyless gas cap and I'll be on my way..."
Rafael, the technician, was surprised that my ring sensor wasn't replaced earlier. Apparently, this was a known issue and there was a recall that replaced the sensor with a newer part that was less prone to failure. I shrugged my shoulders. Never got the call... 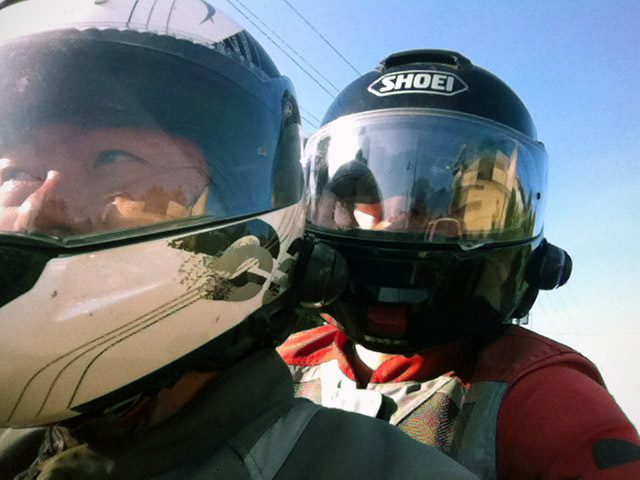 He told me that he had an old ring sensor that he took off another bike that was still good, but because it was the older part, it might fail: "Maybe tomorrow, maybe three years from now, maybe never?". 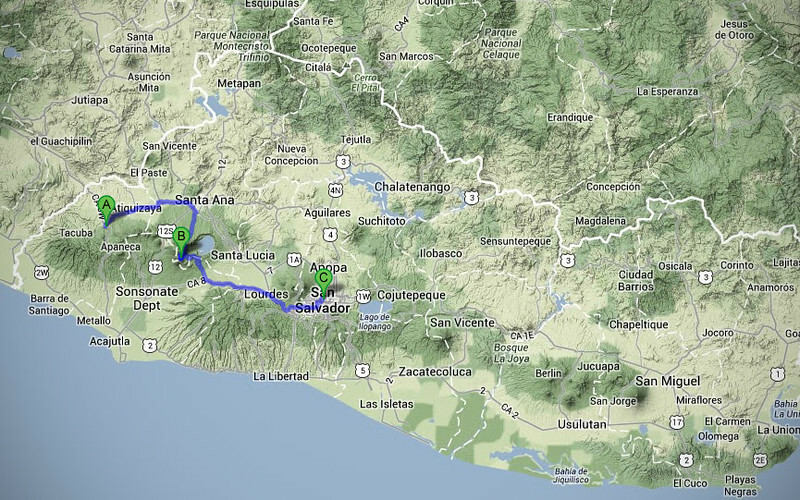 So off we go on Neda's bike, 100kms back to Ahuachapan. 100kms back to San Salvadore the next morning. I had plenty of time to ruminate over how complex these bikes have become. Back in India, I was on my hands and knees fixing that bloody Enfield every single day. But I was able to. I could use anything: sticks, stones, bailing wire to keep that thing going. But now, computers and sensors and chips meant that you could be stranded and not be able to do a damn thing about it until you got that same electronic part replaced. 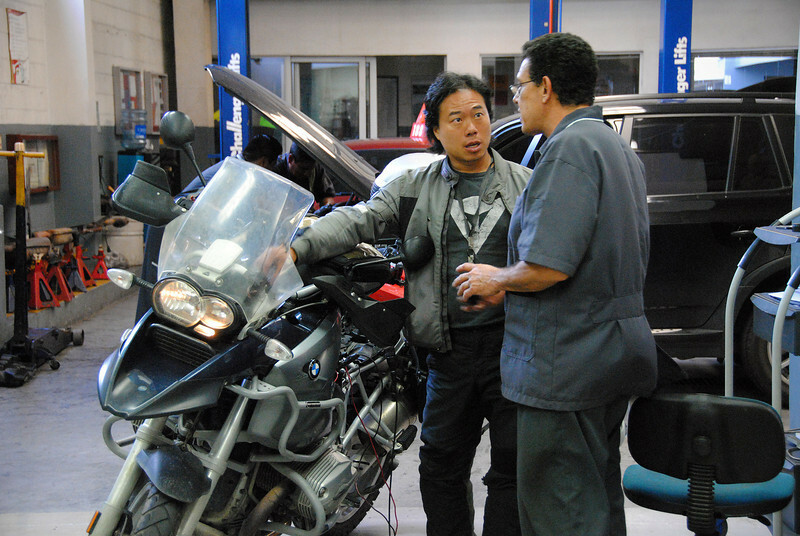 I thought about all the places we wanted to visit, some nowhere near a BMW dealership. 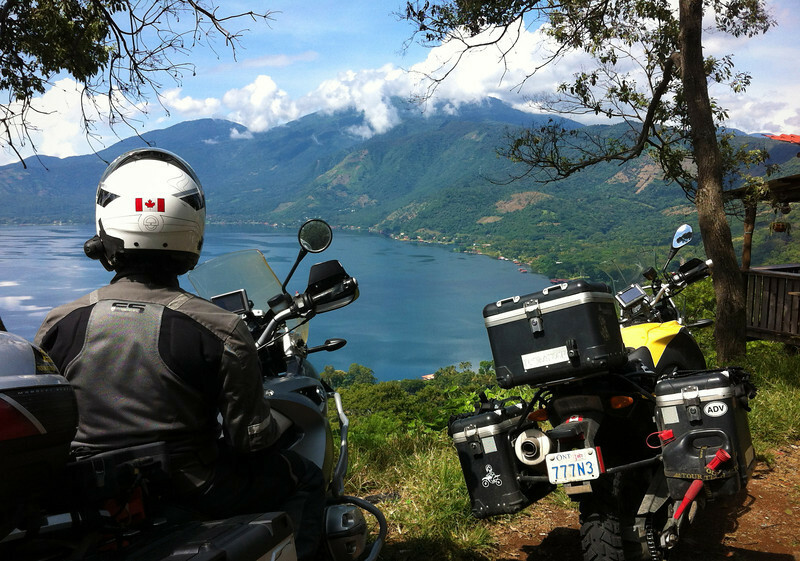 Is it feasible taking a computerized two-wheeler to the remotest places on Earth? One does not simply walk to San Salvadore. Back in business. We thanked Rafael and now we're back on the road, baby! Timing the weather in a new country is tricky. Still haven't got the hang of it.